Time to tap the SPR to avoid a recession? OK, so much for record highs by the Fourth of July. That was the bold forecast our Alan Knuckman issued from his perch in the Chicago options trading pits back on Flag Day, June 14. Markets closed early today so the few traders not already on summer vacation can get a jump on their Independence Day festivities. Here’s the final scorecard for the major U.S. indexes…. Russell 2000: 1,660 — a mere 2.7% below its record close two weeks ago. We’re not going to fault Alan. We’ll never fault an editor for sticking his neck out there. Being wrong now and then comes with the territory. You don’t get very far in the newsletter biz being wishy-washy. Besides, trading the major averages is not how Alan recommends his readers squeeze meaningful profits from the market. Instead, he recommends limited-risk options on individual companies. A rifle, not a shotgun. Meanwhile we’re only 10 days away from the start of Alan’s favorite time to trade. Quarterly earnings season begins a week from this Friday. “It’s going to be a big one, too,” he tells us. “According to FactSet, S&P 500 earnings are expected to rise 19% from the same period last year. Nine months ago, Alan launched an options trading advisory keyed to the 42 days of earnings season. Our marketing folk gave it the cheeky name of the 42-Day Retirement Plan. Three months ago, going into the most recent earnings season, we were touting how every closed recommendation in this service was a winner — 27 for 27. That was a span including the market’s steady run-up from October through January, and the volatile period afterward. We were delighted to say that. We also knew that streak would end sooner or later. That’s just the odds. So in the interest of full disclosure, we’re compelled to update the track record today. Since launch in October, there’s a total of 51 closed trades. Thirty-four of them ended in the green — that is, two out of every three trades is a winner. Out of all the trades, winners and losers, the average trade generated a gain of 18.7%. Some of those trades took a few months to play out, others just days. And this coming earnings season has the potential to be the most lucrative of all, thanks to a quirk Alan calls “the Fourth of July jackpot.” No, the gains don’t come while the market is closed tomorrow… but for best results you want to be positioned before the market reopens on Thursday. Alan explains all when you click here. As you might have heard, oil punched through $75 this morning. As you might not have heard, it didn’t stay there long. At 10:00 a.m. EDT, a barrel of West Texas Intermediate tumbled nearly $2, from $75.20 to $73.24. Explanation eludes us, other than to say what we said two years ago: Crude futures are one of the most manipulated markets in existence, next to gold futures. The other is new — the government of Libya declaring “force majeure” on crude exports from two of its ports; that is, unforeseen circumstances that prevent the government from fulfilling its obligations to deliver. In this case, the unforeseen circumstances are a flare-up in Libya’s civil war. The result: The two ports that ordinarily process 850,000 barrels a day are out of commission. Oy… Barack Obama’s decision to topple Muammar Gaddafi in 2011 is the gift that keeps on giving. As a reminder, $75 is the level we said last fall might tip the U.S. economy into recession. $75 amounts to — more or less — a tripling of the oil price in a little over two years. A tripling of the price in that span of time isn’t necessarily a deathblow to the economy. But when an economic expansion is this long in the tooth — we’re now nine years since the end of the “Great Recession” — it’s usually trouble. Perhaps for that reason, we see the Trump administration is already “walking back” its boasts about cutting off all of Iran’s oil exports. As we mentioned last week, the State Department intended to tell all of Iran’s oil customers to cease their oil purchases no later than Nov. 4. “We’re asking them to go to zero,” is how one official put it. That included Iran’s two biggest customers, China and India. Yesterday, the State Department adjusted that stance: “We are prepared to work with countries that are reducing their imports on a case-by-case basis,” policy planning director Brian Hook told reporters. That was in response to a question about India and Turkey — Iran’s No. 2 and No. 4 customers. Of course, if the aim is to keep a lid on oil prices, there’s always the option of a carefully timed release from the U.S. Strategic Petroleum Reserve — the government’s big oil stockpile in the salt caverns of Louisiana and Texas. Gold came *this* close to breaching the critical level we warned you about last week… but going into the holiday the Midas metal has pulled back from the brink. 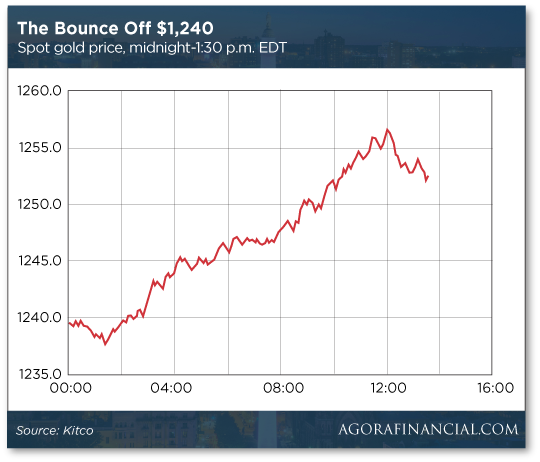 After we went to virtual press yesterday, gold slipped to $1,240. That’s an important level because it marks the bottom gold set in mid-December 2017. Gold has set important bottoms in mid-December for three straight years, and those bottoms have always held. If the most recent one were to crack, it would be a bad omen. Check out the action starting in the electronic markets at midnight EDT, continuing through the Comex close at 1:30 p.m. If you’re looking to add to your gold stash and you’ve been waiting for the right moment to capture as much upside as possible… we daresay it’s whenever your favorite gold purveyor opens for business Thursday morning. We thought we were done ranting about the bogus “stress tests” the Federal Reserve performs on the big banks — at least until next year — but now we learn of an outrageous postscript. 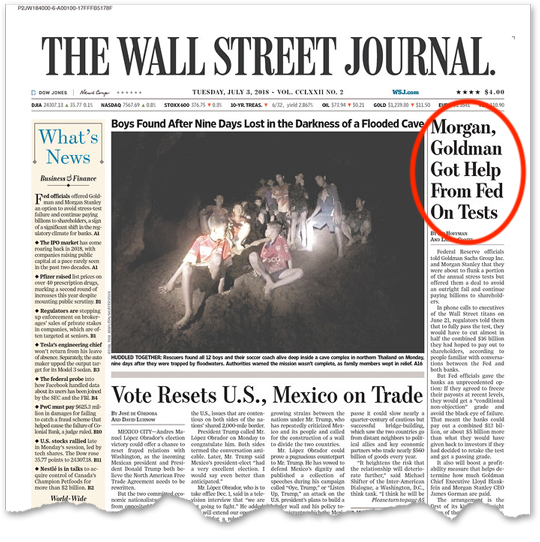 As we mentioned last week, Goldman Sachs and Morgan Stanley were spared failing grades. They got the equivalent of an “incomplete” — meaning their dividends and share buybacks would be capped at current levels. Turns out the Fed threatened to flunk both Goldman and Morgan — which would have forced them to slash their dividend and buyback plans in half. OK, that was a good Journal scoop. Now we need to dump on the same paper for dropping the ball. Shopping mall vacancies are now their highest since 2012… and the Journal missed one of the major reasons. Really? It’s all “the Amazon effect”? But the Journal overlooks the critical factor we were citing last year when discussing the retail apocalypse — debt. Private equity firms bought out several major retail chains, borrowing heavily to do so. The debt was more than the chains could withstand, even with ultralow interest rates. Fer cryin’ out loud, the Journal story even mentioned in passing that the last Toys R Us stores closed four days ago… without mentioning the firm’s $6.6 billion leveraged buyout in 2005. Toys R Us might have been able to withstand the Amazon juggernaut. But $400 million in annual interest payments? Too much. Yeah, look closely. 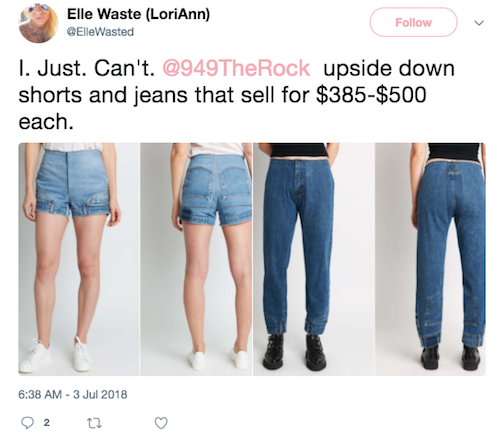 “Cie Denim sells jean shorts that are designed to look like they’re being worn upside down,” reports the Insider website. They retail for $385. Yes! By wearing this apparel, you’re not just telling the world you can afford a $385 pair of jean shorts (or $500 full-length jeans)… you’re signaling your virtue too! P.S. No, we won’t be publishing an issue tomorrow. But we’re back as usual on Thursday with your daily allowance of financial infotainment. See you then.